February is usually the peak of flu season, so I figured what better time for a STEAM program about germs? I have a MS in microbiology, so this was right up my alley! We talked about different kinds of germs, observed which surfaces in the library had the most bacteria and fungi, did hands-on activities to explore how easily germs are spread and learn proper hand-washing, and observed bacteria growing on agar plates as well as under the microscope. We also talked about how most microbes are relatively harmless, and some are even beneficial. I started off by asking them what germs were, and most knew it was something that made you sick and some knew they were microorganisms, bacteria, or viruses. I had a short PowerPoint with a few pictures of different types of germs (bacteria, viruses, molds, yeast, protozoa), including the 3 shapes of bacteria (bacilli, cocci, spirochete), and a few different viruses. We talked about how "germs" are specifically the ones that make us sick, and that many microorganism are harmless or even beneficial, like the bacteria in our gut or those used to make yogurt and cheese, or yeast to make bread or adult beverages. I also showed them the very scary looking bacteriophage, and explained how it was harmless to us and actually infected bacteria, so germs can get germs, too! Then I showed them a photo of bacteria growing on an agar plate, explaining each colony developed from a single bacterium, and pointed out the differences in color, texture, and shape. Then we were ready to start the first activity. 2. 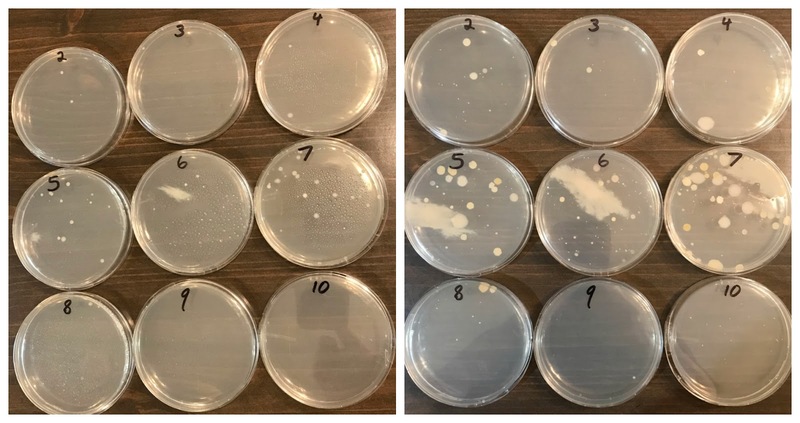 After everyone had marked their choices, I showed a photo of the plates at 24 hours, noting how similar all the colonies looked, then 48 hours, noting that differences in size, color, textures were now apparent, and many new tiny colonies of slow-growers had shown up (#1, the negative control is not pictured). Click on any image to see full-sized. So, to my surprise, the shelf had the most growth, and the books had relatively little! I was very surprised by the books. The shelf was closely followed by the computer keyboard/mouse and play food, which I did expect. While it might seem counter-intuitive that the bathroom surfaces were some of the cleanest, our custodian cleans and disinfects it every morning (I sampled at the end of the day). Now, don't let this freak you out! In reality, these are all very low numbers and in all likelihood are mostly harmless bacteria and molds that are to be expected in the environment. We talked a bit about how germs are spread, and they mentioned sneezing and coughing right away, for which I did a fun simulation. First, prior to the program I had punched a bunch of holes from several brightly colored scraps of paper to make confetti. Then I put the confetti inside a balloon, blew up the balloon, and tied it off. I explained the confetti represented germs, and popping the balloon would represent a sneeze. On the count of three, we all yelled "Ah-choo!" and I popped the balloon, sending the confetti everywhere, up to about 10 feet. I told them germs from a sneeze can travel up to twice that distance! Then we talked about how to properly cover your coughs and sneezes. We all know how glitter seems to spread everywhere, so I got the idea to use it to show how germs spread by touch. I pressed my hand into a flat container with glitter, then shook hands with a few of the kids, and instructed them to shake hands with the person next to them, and so on to show how germs spread from our hands, and to our hands. They saw it spread from person to person, and I also pointed out some of it had gotten on the table. I asked them to think about what would happen if they rubbed their eye with their glitter-contaminated hand? What if they picked up food with it? What if they put their food directly on the contaminated table? This led to a discussion of how important it was to clean food-prep and eating surfaces and to wash hands, and we talked about when to wash hands, such as after going to the restroom, playing outside, before eating, etc., and how our skin provided great protection against germs, and that germs make us sick by getting inside through our mouth, nose, and eyes. I stressed in addition to handwashing, we should keep our hand out of and away from our mouths, noses, and eyes, and not to break any bad habits like chewing on pencils. Glo-Germ lotion contains a pigment that glows under UV light and is difficult to wash off, so it makes a great tool for evaluating and educating about handwashing. Each person was given a dime-sized squirt of the the lotion and told to rub it all over their hands, rubbing it in until their hands were dry. Then we examined with a UV flashlight to see how it glowed. Then they were instructed to go wash their hands really well with soap and warm water (there was one sink in our program room and the restrooms were just outside). Then we checked their hands with the UV light again. Although most showed some reduction in the amount of "germs" remaining, only a few showed a significant reduction and all still had some remaining under and around their finger nails. They were given the option of washing their hands again and re-checking, or waiting until the end. I think it was an eye-opening experience for some of their parents, LOL! At the end, I had three different activities they could rotate from, so everyone would have a chance to look at the plates up close and look in the microscope. A. Our library system already owned a high school classroom quality microscope with a collection of assorted prepared slides. I put a slide of stained bacteria so they could have a chance to actually look at germs. There were also photographs of bacteria under both an optical microscope and scanning electron microscope in the PowerPoint slides. B. I had all the agar plates out on a table *taped closed* with an assortment of magnifying glasses so they could look at them up close and observe how varied the colonies were, with various shades of white, cream, yellow, and orange; some were round, some irregular, some filamentous; some were smooth, others were wrinkled; some were wet and shiny looking, while others looked dry. (There was also a diagram showing different morphologies in the PowerPoint.) As always, click on the image to see it larger. C. Books - I had an assortment of both fiction and non-fiction books displayed on a table that they could either look at there or check-out and take home. I thought it went very well, and I really enjoyed getting a chance to return to my roots and do a little basic microbiology. I only wish I could've justified the expense of buying the selective and differential media and stains required to identify some of our specimens. The participants really seemed to enjoy all the activities. The simulated sneeze and the agar plates from testing surfaces in the library were probably the most exciting, though they were surprised at the results; most thought the bathroom surfaces would be the worst. One of my participants seemed to know about as much as I did, even though he was only in 4th grade and I have a master's degree in microbiology! He kept giving such precise, detailed answers that I would not expect from a child that it threw me a little bit at first. He also asked if I had any pictures of Helicobacter pylori because it was his favorite bacterium! I'm a microbiologist, and I don't even have a favorite bacterium, LOL! Another funny comment came from one of the girls. I showed a photo of the growth from the handprint of am 8-year old child who had been playing outside, and she wanted to know if it was a boy or girl, because according to her, boys are dirtier. (It actually was a boy, btw). And, if you want to see something really cool, do a Google search for "petri dish art"! 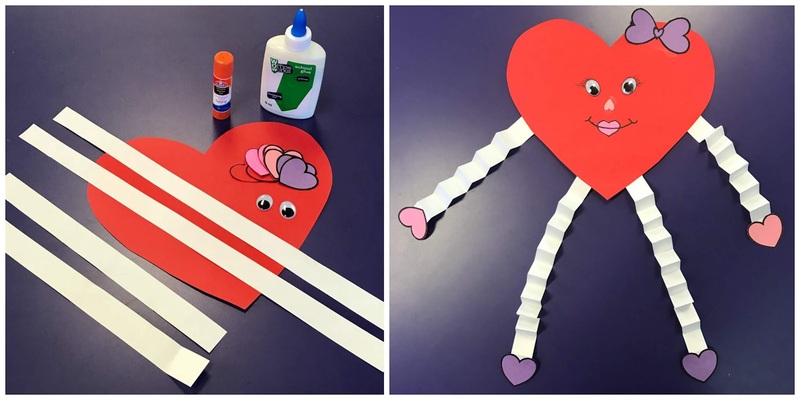 Also, if you'd like to do something Germ-themed for preschoolers, check out my "Don't Share Your Germs" storytime. I had actually planned a Valentine's theme, but the crowd I ended up with was way too young for the only actual Valentine's Day book I had (Froggy's First Kiss), so I ended up using the shorter books I had pulled, which were all about hugs and kisses, though we still did some Valentine's songs/rhymes. We started with our welcome song, and then I introduced the topic. 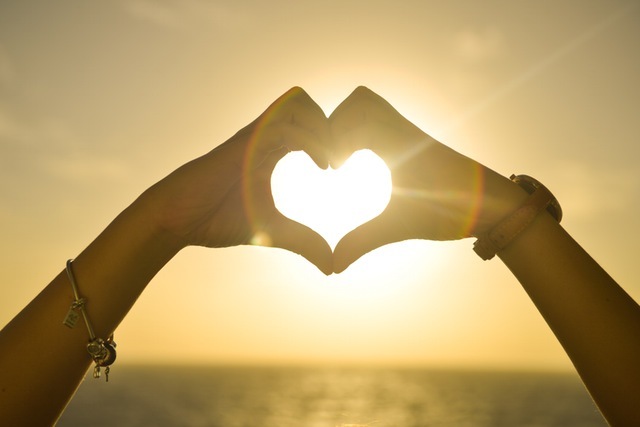 We talked about how Valentine's day is about love, and the ways we can show we love someone, ending with hugs ("let's all give ourselves a big hug") and kisses "can you blow kisses?"). Then we got settled for our first book by singing our story song. 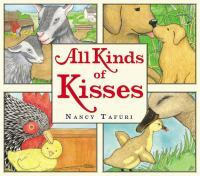 For our first book I selected All Kinds of Kisses by Nancy Tafuri because it focuses on familiar farm animals and the sounds they make, which I hoped some of the younger ones would recognize and be able to do. I also like that it shows mother animals with their babies, and introduces some new vocabulary with the specific names for the young, like "calf" for a baby cow, "kid" for a baby goat, etc. The text is short and simple, and the illustrations are Tafuri's typical sweet, simple, and slightly understated style (though I'd actually prefer slightly bolder). We followed that with a little movement. I introduced the following rhyme by having them feel their heartbeat, then jump up and down and see how it beats faster. One for mother, one for father, one for grandma, too. Here is one for you! 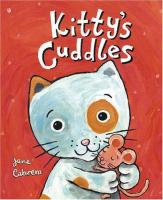 We went from kisses to hugs with our second book, Kitty's Cuddles by Jane Cabrera. I fell in love with this book as soon as I saw it because of Cabrera's bold, rich illustrations that have a heavy texture that makes me want to touch them. In this book, Kitty shows us all of her friends, and we try to guess her favorite one to cuddle with. While the first book featured familiar farm animals, this one introduces some exotic animals, like the peacock, porcupine, and armadillo, and has short, simple text. 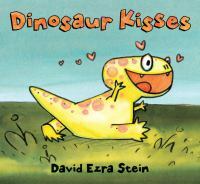 I debated on whether to read a 3rd book since my crowd was so young, but it seemed all the super wigglers had already bailed, and the remaining kids were having no problem listening, so I decided to indulge my dark sense of humor and end with a favorite funny book about kisses that is still short and simple, Dinosaur Kisses by David Ezra Stein. In this story a hatchling dinosaur is exploring the world and after witnessing a kiss, decides she wants to try that next. But every time she tries to kiss someone, it goes horribly wrong as she accidentally whomps, chomps, stomps, or EATS her intended recipient! Then another dinosaur hatches out, and they have fun chomping, stomping, and whomping each other, then falling down in a fit of giggles. We then sang a closing song, and moved on to our optional craft, which only a few of those attending were really old enough to do. For our craft I had originally wanted to give them lots of hearts of assorted sizes and colors and have them put them together to make various animals, a la Michael Hall's My Heart Is a Zoo; however, our copy was checked out and our new ILS is so slow at processing requests that I didn't get a copy from another branch in time, plus I didn't have time to cut out all those hearts. This was a perfect storytime for 2-4 year-olds. Unfortunately, I had a bunch of infants and 1-year olds! I had such a sinking feeling when I realized this, especially since at first it was all babies, until thankfully one family showed up a few minutes late with two boys around 3-4. I just froze mentally and didn't know what to do, other that power through what I had planned. I have extensive experience with preschool storytime, but I have never done a baby storytime and only a couple toddler storytimes, and was not at all prepared for such an overwhelmingly young crowd, and did not know how to change gears that drastically at the last minute. It was a very frustrating and humbling realization. I should have incorporated a couple of baby bounces, but my mind just went blank since it's not something I've done since my own kids were babies! I always have a couple of longer books in case I get older kids, but I realize I have not been adequately prepared for an even younger than the usual young crowd. Despite the program not really being quite developmentally appropriate for most of the audience, it went okay, though I did lose some of the audience right away. But that always seems to happen anyway as our storytime area opens into the play area, and some kids are just too distracted by the other children playing behind them. Some of the younger kids could be heard making animal sounds, or seen trying to imitate some of the motions we did, and though the two oldest got a little bored during the second book, they LOVED Dinosaur Kisses and laughed and giggled. Thankfully, most of the parents participated and helped answer for their babies, and reinforced what I was doing.